VIDEO: A Year of Protests & Organizing After Unarmed Black Teen Michael Brown Killed by Ferguson Cop | Democracy Now! It was one year ago today, August 9, 2014, when eighteen-year-old Michael Brown was shot to death in the suburb of Ferguson, Missouri, as he reportedly walked in the street with his friend when a police officer drove up and ordered them onto the sidewalk. Police claim Brown physically assaulted the officer and tried to reach for his weapon inside a police car. But witnesses provided a sharply different account, saying Brown was shot with his arms up as he tried to flee the officer’s fire. Brown had recently graduated from high school and was due to begin college courses. Protests began immediately after the shooting, with tensions escalating when demonstrators were met by riot police with dogs. As peaceful protests continued into the next week, Democracy Now! went to Ferguson and spoke to young people who live near the site where Brown was killed, including some who knew him personally. “He fell on his knees. Like, ’Don’t shoot.’ [The police officer] shot him anyway in the eye, the head, and four times down here,” said one local resident Rico Like. The Committee to Protect Journalists called on the Ferguson Police Department to stop harassing and detaining journalists covering the protests. We spoke to Ryan Devereaux of The Intercept, who was shot by a rubber bullet, arrested and jailed overnight. Protests erupted again in November after a grand jury in St. Louis, Missouri chose not to indict Ferguson Police Officer Darren Wilson for the fatal shooting of Brown. The decision followed three months of deliberation by the jury of nine whites and three blacks, including four hours of testimony from Wilson himself. The grand jury decision set off outrage in Ferguson and communities across the country who see Brown’s killing as part of a wide-scale pattern of police mistreatment of people of color. In a statement, the Brown family said: “We are profoundly disappointed that the killer of our child will not face the consequence of his actions.” Democracy Now! was in the streets of Ferguson where Amy Goodman interviewed protesters about their reaction. The U.S. Department of Justice has since called for a major overhaul of Ferguson’s criminal justice system after finding systemic discrimination against African-American residents. After Brown’s shooting more than a dozen St. Louis-area residents filed class-action lawsuits against the city and another suburb, Jennings, accusing local officials of creating a “modern debtors’ prison scheme” that targets African Americans with arrests and fines and then locks them up when they cannot pay. A study by the ArchCity Defenders found a large part of the revenue for several St. Louis counties comes from fines paid by African-American residents disproportionately targeted for traffic stops and other low-level offenses. In Ferguson, fines and fees were the city’s second-largest source of income in fiscal year 2014. We spoke to Michael-John Voss, managing attorney at ArchCity Defenders, and Allison Nelson and Herbert Nelson Jr., two of the plaintiffs in the class-action lawsuits. 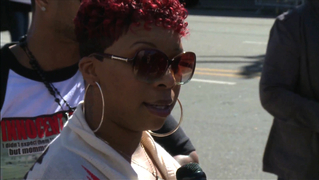 In March of this year, we interviewed Michael Brown’s mother, Lesley McSpadden, as she marched in Selma, Alabama, to mark the 50th anniversary of the protest for voting rights. “My son would have been able to vote had he still been alive for the election coming up,” McSpadden says of Brown, who was 18 years old when he was shot dead. She responds to the DOJ’s report that documents police harassment, abuse and racial profiling of African Americans in Ferguson, and the announcement that Wilson will not face civil rights charges. She calls for the resignations of the Ferguson’s police chief, the mayor and Missouri Gov. Jay Nixon. Darren Wilson, along with Ferguson’s white city manager, police chief and municipal judge have all since resigned.